If I hadn’t been too busy having a break from the PC over the Christmas/New Year period, I’d have written this sooner. I did spend some time over the holiday reflecting on tools I’d enjoyed using in 2015 however, so, better late than never, here’s my round-up of favourites from the last 12 months. What a find! I’m hugely grateful to Denise Cowle for telling me about Canva, a design tool which is free and helps you put a professional look to presentations, social media images, posters, etc. I’ve used it for PowerPoint slides, Facebook posts, Mailchimp campaigns and blog posts (see top image in this post). It’s totally free unless you choose to use premium images or designs, which are $1 a time, and its drag and drop interface is idiot-proof. Watch out for lots more smart visuals from me in 2016. Another freebie unless you upgrade to their Pro or Business levels, which, if you’re a member of a small team or just working on your own, there is absolutely no need for. Toggl is a time-tracking tool that syncs across your desktop and mobile devices to allow you to keep a log of the time you’re spending on individual projects. Projects can be broken down further to task-level if you need more detail. Smart-looking reports at the end of each day/week/month show you where you’ve spent your time, and you can export these to send to clients with an invoice. Anyone who’s followed my White Ink Facebook page for any time knows I’ve been wedded to my notebook and coloured pens since 2008 for logging time, but last year I had to use Toggl as part of a team for one client, and after a period of ignoring it and assuming I’d forget to turn the timer on and off efficiently, came back to it as an experiment in December. 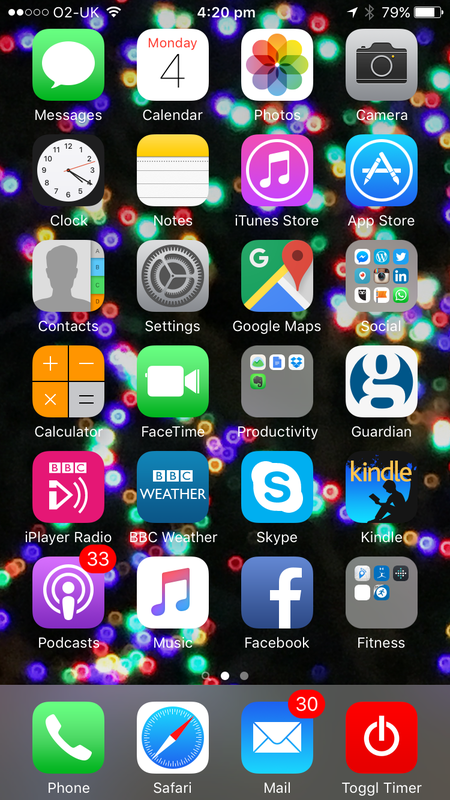 I got into the swing of it so much that I’ve locked the app to my iPhone dock for easy access. Notebook, be gone! This is another tool that I’ve heard project managers, writers and others rave about in the past. I signed up over a year ago, had a fiddle around, then left it in the corner of my desktop to languish. I could see a use for somewhere to save articles to read later but had always just emailed them to myself and put them in an Outlook folder. Then I started writing this blog and came back to Evernote as a place to note down ideas for posts, and store links and images that related to those ideas. Stuck in Gibraltar airport on the way back from holiday, I used Evernote on my iPad to write a blog post, and have been hooked ever since. It’s another tool that syncs across my PC desktop, iPad and iPhone, and has a neat interface that appeals to me. There are lots of useful features such as the ability to tag notes for easy retrieval and categorization, make lists, annotate images, and you can use a messaging feature if you need to discuss anything with a team. As with Toggl, it’s free unless you want to go for Plus or Premium features. I’d been thinking about writing an occasional blog for some time. On the White Ink Facebook page I post a daily tip, link or photo, but sometimes want to write more. Only when I got my sit/stand desk did I finally get round to it, and it was really only after I’d written my first post and published it that I started to look at the Reader feature and read others’ blogs. Prior to that, I’d subscribed to blogs and got email notifications of new posts, but it’s great to have them all in one place. I really wish I’d found the world of blogs sooner – both writing and reading. I’m sure there’s a post about the ones I read most often coming later this year. WordPress is simple to use (although I’m learning something every time I write and publish a post) and free at the basic level, but if you want to set up a website that’s more than just a blog, make sure you register at WordPress.org rather than WordPress.com. Many more widgets, themes and options available at .org, but not all are free. Just for fun. This is a free app for funking up your photos with text. Endless options for layouts, colours and backgrounds if you don’t want to use a photo. Expect to see the fruits of my fiddling with this on the blog until I find something to trump it. Haven’t found a sensible use for the ‘creative quotes’ feature yet though. The one I flirted with but will spend more time getting to know better this year was Periscope. I can see some applications for this in my freelance life, but like any other social media platform, it’s going to take some effort. I’ll let you know how I get on later in the year. Hope there’s something here that you didn’t already know about. What tools should I be looking into in 2016? Thanks Sophie, and happy new year! I can see your point about Canva, but for those of us who don’t have access to a designer for the odd thing, it’s really handy. We’ll still need your professional skills – even though it makes small images better looking, I still don’t have any proper idea about how to balance the look or colours of fonts etc. I’ve also been using Toggl, partly out of necessity, but also for other things. I really like it as well. I also use the Pomodoro app Tomato Timer http://tomato-timer.com/ to remind me to take breaks! I hadn’t heard of Canva so thanks for that, I’ll have to take a look. If you work on a mac, you could try ‘Magnet’. It isn’t free (3.99), but to organise a twin-monitor desktop when you need a load of different windows open and visible at the same time, it’s great. I’ve found it extremely useful. Hi Richard, thanks for commenting. I haven’t used a Pomodoro timer, but do try and take regular breaks – I went through a phase of setting a timer on my phone last year, but it got ignored a lot. Glad it works for you. I don’t know Magnet, and don’t have a Mac desktop, but I’ll have a look and tell others – sounds very useful. Wonder if there’s a PC equivalent?